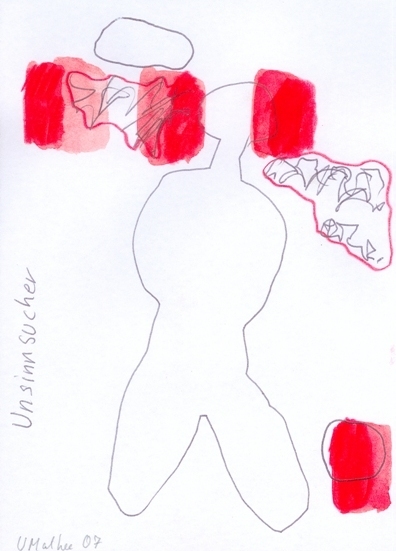 Udo Mathee is an artist who first works out his themes in words and then on the basis of the content and meaning of the words shapes his themes into artworks. Quite often they end up with titles that, as he says himself, are nonsense yet filled with meaning. This work Sinnvoll can serve as an example of this method: in the German language it is said that ‘things have sense’ over against the English expression that ‘things make sense’, which means that things are logical or seem right. ‘Having sense’ is deeper and more fundamental and presupposes a transcendent level, while ‚making sense’ remains on a functional level. The words ‘sinnvoll’ and ‘voll Sinn’ signify the opposite of emptiness. ‘Sinnvoll’ means to be completely filled with meaning and implies fullness, abundance, blessing. The vase with the title ‘Sinnvoll’ painted on its exterior is about 67 cm high and made of oak wood. Outside it is painted with acrylics, oil crayon and felt-pen and inside it has been covered with gold leaf. On the outside of the vessel is a deep crack that runs from top to bottom. 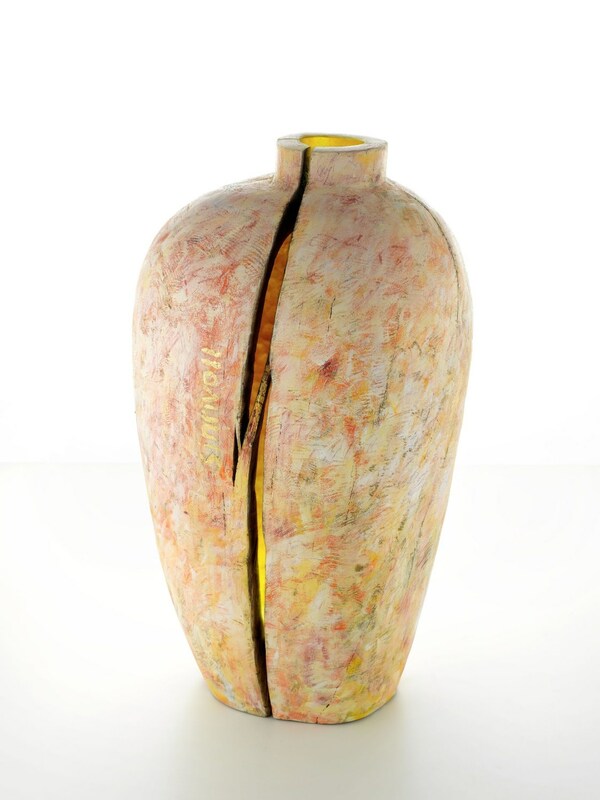 Golden light shimmers through the crack when light falls into the vase from above. A vase with a crack? Filled with meaning? What meaning has a vessel that has been so severely damaged? To better understand the intention of the artist with this work it is important to know that for Udo Mathee vessels stand for people. This is also a recurring theme in his series with houses and drawings. He searches in his work for the meaning and value of human beings, who all too often do not base their worth on their calling by Jesus Christ as sons and daughters of their heavenly Father, but rather on their usefulness, personal merit and on flat ideas of human value. The meaning of each human being is determined by God, whose creatures we are. After Pentecost and the descent of the Holy Spirit there can be no doubt that our meaning and worth are not established on the basis of human values, but rather based on the love of the Father shown in Christ. He elected what was rejected and looked down upon by the world. More than this: we have received his seal and we are filled with his Holy Spirit that has been poured out in our heart. We can rest in him, because his power is strong in our weakness. ‘But we have this treasure in clay jars, so that it may be made clear that this extraordinary power belongs to God and does not come from us’ (2 Corinthians 4:7). Hundred years later the world waits more than ever for artists who let themselves be moved by the power of the Holy Spirit to speak, stammer and express themselves in the language and power of the Holy Spirit. Udo Mathee is one of those who are attempting to follow this path. Udo Mathee: Sinnvoll, oak, acrylics, oil crayon, felt-pen and gold leaf, ca. 67 cm x 40 cm, 2010. Udo Mathee is a member of the Vestischen Künstlerbund, Recklinghausen and of the Deutschen Gesellschaft für Christliche Kunst (DG), Munich. He works mainly with wood. Udo Mathee was born in 1952. From 1967 he was trained as a lathe operator and from 1970 he studied mechanical engineering, after which he went on to study with Prof. Schönwald at the Institut für Kunsterziehung in Aachen. 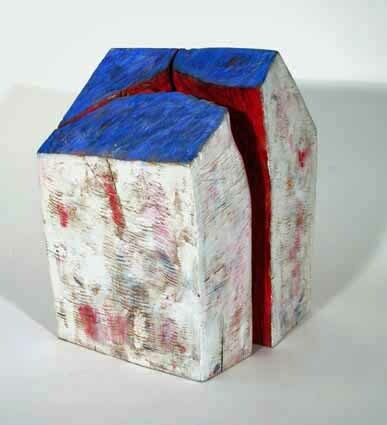 Since 1995 he has lived and worked as a sculptor and journalist in Coesfeld, Germany. Johannes Manz is initiator and gallery manager of Galerie ASPEKT, Maximilianstraße 18, 67433 Neustadt, Germany. http://www.aspektgalerie.com – also on Twitter and Facebook.